Gil Shaham on Bach: "I think this music transcends everything. It transcends time, and performances, and cultures -- and tempos!" As they are for many violinists, Bach's Sonatas and Partitas for solo violin have been a lifelong exploration for Gil Shaham, who started playing them as a child and has just released his first complete recording of them earlier this month. For the project, Gil Shaham outfitted the 1699 "The Countess Polignac" Strad that he plays with gut-core strings and a Baroque bridge, and he also used a Baroque bow. He took about 12 years re-thinking the works before recording them, and the result is a virtuosic, up-tempo interpretation, full of revelations. The CD also includes fantastic liner notes written by former Strad Magazine editor Ariane Todes based on extensive discussions with Gil. As part of his spring tour, Gil will be giving several performances of all six Bach Sonatas and Partitas, set to a video production by filmmaker David Michalek (including a performance this Sunday at Disney Hall in Los Angeles, which I plan to attend). Laurie: What is the first Bach sonata or partita that you ever played, do you remember? Gil: I don't remember exactly. But I do remember being about 12 and playing the B minor Partita, the one with all the doubles. I remember thinking it was so beautiful, and I especially loved the Sarabande. I thought that it was so cool that the violin could play all these chords, that the violin could sound like an organ, or many instruments, or an orchestra. Laurie: The Bach Sonatas and Partitas are some of the few pieces where the manuscript is widely available. 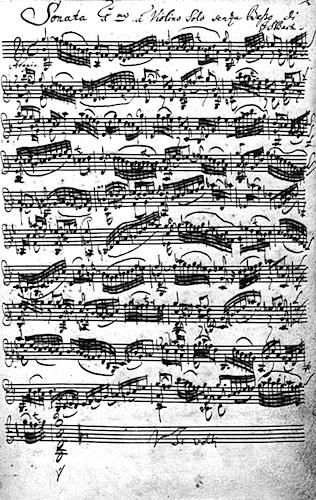 I don't know if Bach wrote that in his own hand or his wife transcribed it, but it's like a beautiful work of art. Gil: It's beautiful, yes. The music is so perfect by itself, just looking at it on the page. I love that part where they add a couple of lines at the bottom of the page -- because paper was so valuable. That's what they would do all the time, just to save paper. It's so different from how we work today. Laurie: Do you remember which edition you started with? How many do you have by now? Gil: As a kid, I had the Carl Flesch edition and I had the Galamian. Now I have maybe five or six. When we went to record it, I brought my bound autograph version, an Italian-published, bound copy of the manuscript. But they needed me to come up with an edition, so they brought me a copy of the Barenreiter. Laurie: Do you read off the autograph, off the facsimile? Laurie: I imagine the way you played it many years ago, when you were 12, is really different from the way you play it now. In what ways do you feel like your interpretations or your feelings about these works have changed? Gil: I'm definitely playing them very differently today from 15 or 20 years ago. Maybe it's my mid-life crisis, but I'd like to think that now that I have a little more perspective and maybe a little better understanding of what the music is about. Laurie: Has the period performance movement informed you? It sounds as though you decided to use a Baroque bow -- tell me a little bit about that decision. Gil: I thought it would be fun to experiment with gut strings, and a Baroque bow and a Baroque bridge. When you use the Tourte bow and the hair touches the string, there's a natural resistance, so that you get this sort of automatic articulation. Whereas, with the Baroque bow -- what Leopold Mozart called the "round bow" -- rather than a resistance, it actually eases into the string. As the string pushes into the hairs of the bow, not only do the hairs not give resistance, they actually give in to it. That produces a very gentle attack, and I love that, I think it's so beautiful. So I'm a little bit addicted to that right now. Laurie: Before you embarked on this recording, had you used a Baroque bow much? Gil: I tried it once or twice, but not as extensively as I have in the last few years. Laurie: Who made your bow, and how did you pick the particular Baroque bow that you are using for this? Gil: Markus Laine, here in New York, made it. I've known him for many years and he's always rehaired my bow. We started talking about it and he's very knowledgeable. Markus said he used a German bow from around 1730 as his model. And then Adam Crane built the bridge, also made from a Baroque model. They are two people I've known for a long time. Laurie: Looking at the pictures in the liner notes, they are beautiful objects of art, both the bridge and the bow. Gil: The Baroque period was such an incredible time -- the Baroque musical explosion. The spirit of experimentation was everywhere, and I find that to be so inspiring. So I thought I could do little bit of experimenting on my own! Laurie: I've heard that it's easier to play faster with a Baroque bow, do you find this to be true? Gil: The bow is much lighter and shorter and somehow it seems to go faster. Also, with that kind of soft articulation, you can get a lot of clarity because not every note has a (strong) attack on the beginning. Laurie: Does it make it easy to do the string crossings, such as in the Preludio? Gil: I find that it's a very different feeling. The bow's much lighter, and I find that it does go faster. Laurie: What does the Baroque bridge do for you? Gil: The curve is a little bit flatter on the bridge, but also it's quite a bit higher. So I found that just putting my fingers down on the string had a completely different feeling. Somehow there were many more gradations of putting your fingers down, which I thought was interesting. I really sort of went back to basics: how do I put my finger down? How do I move my bow? How do I hold my violin? Laurie: How did you change the way you hold your violin? Gil: I don't really hold it like those old pictures of the tanzmeisters pulling out their little violins, holding them...But there is something about that, that's much more natural, more ergonomic. Laurie: Putting it more in front, you mean? Gil: Yes. When you hold the violin, especially when you go on the G string, you have to take your left elbow and push it to the right, and it's different from holding a lute, or a viol. Maybe a little bit more like that. I like to think my body is looser. Laurie: When it come to the Baroque bridge, if you are doing Bach in a concert, and then you are doing Barber the next day, do you switch out the bridge? How does that work? Gil: For a while there, that's what I was doing. I would switch back and forth! Laurie: And you changed the bridge yourself? Laurie: Wait, a "bridge jack"? What is that? Gil: I don't know if that's the official term...It's a little thing you put behind your bridge and then there's a little screw and you wind it up or wind it down, and it holds the strings up for you. And then you can take out your bridge and replace it with another bridge. Gil: It's kind of fun, right? So for a while, I was doing that. But then I found out that you can really do everything with a Baroque bridge. You can play Barber Concerto on a Baroque bridge, it works fine. I actually want to play everything with a Baroque bow and bridge, you know? But now I've gone back to my modern set-up. Next couple of concerts I'll be using my Tourte bow and my modern bridge. Laurie: And how about the gut strings? What kind of guts are you using? Gil: I do love the sound of the gut strings, I find them to be richer than the metals. For a while I was using Olivs, and then for a while I was using Passiones. But then I had a couple of trips where it really was temperamental; they would squeak and they would go out of tune. So for concerts, I've sort of gone back to using the Dominants, just for safety. I have so much experience with them, so I feel like I know what they're going to be like, I know what they're going to sound like. And they adjust overnight. Laurie: What did you use for the recording? Gil: For the recording I kept my Jargar E, but I used Olivs. Laurie: Do you have a favorite, of these Sonatas and Partitas? Or is that a little bit like picking a favorite child? Gil: It's a little bit like that! It's incredible how different each piece is. Maybe that's part of why they work as a set. Because it's not clear that they should be a set. Bach himself would pick one movement here and put it there -- the G minor fugue was transcribed, by itself, for organ; the E major Preludio the Preludium Sinfonia to Cantata 29. But maybe, as a set, they really do work. They were published as a group of six and there's certainly a lot of variety between them. Laurie: It feels a little bit like a trip around the world. Gil: A trip around the world -- I love that. Laurie: They really do take you on a journey, a very colorful one, to so many different places. Gil: There are even readings of them as a re-telling of the scriptures. I do think that they link up; there's some dovetailing from one piece to the other, one movement to the next. Laurie: What kind of practice regimen did you need, to get all of these in your hands at once? Gil: I would say easily, it was the most I've ever practiced. I think I started (preparing) them 12 years ago. I didn't play the pieces in public for a long time. I just didn't feel like I was confident enough to present it for an audience. And people feel very strongly about the music, I feel very strongly about the music. Then I made a concerted effort -- no pun intended -- to play it in concerts. I started each season to play a different one, for the first six years, just sort of focused on one. Then I started playing concerts of just solo Bach. And I just love it. So many other musicians have said it, and it's true: There's nothing more satisfying, nothing more rewarding. There's no greater joy, there's nothing more fulfilling than playing Bach and studying Bach, being around Bach. Laurie: You said it was easily the most you've practiced, but I don't know how much you normally practice. What does that mean? Gil: I would go into the practice room and, just to get through the pieces takes a couple of hours. Quite a lot. Some days 4-5 hours, and I'd try to do it every day. It's true that I play this music faster these days than I used to, and some people have been surprised. Listening to other music by Bach, it seemed like we were playing (the Sonatas and Partitas) slower -- or I was playing them slower -- than comparable pieces from the time. For example, the fugue from the the first orchestral suite, (he sings it, it's brisk), it's not really the same as the tempo that I used to play the G minor fugue (he sings the G minor fugue, quite slow). I thought maybe it should be the same. Or the Minuets, or the Sarabande, or the Chaconne. A lot of things started to make sense for me at the faster tempos, like notation. Thirty-second notes sounded like 32nd notes. Sixteenth notes sounded like 16ths, "a la breve" sounded like "a la breve." I feel like it swings better now, it makes more sense. Laurie: The Chaconne sounds really interesting at the speed you played it. It solves some of the problems of voicing it, just to put it at a faster speed. Gil: Bach did actually write one other Chaconne, which was in Cantata 150, and it's quite fast. If you listen to other composers' Chaconnes, or Ciacconas, they seem to be faster than the way I used to play the Ciaccona. Laurie: It's already a really deep piece, so to play it really slow can get ponderous. Gil: Possibly...but I think this music transcends everything. It transcends time, and performances, and cultures -- and tempos! Laurie: I understand that you will be performing all the Bach Sonatas and Partitas with film as part of your spring tour, including a performance this Sunday at Disney Hall in Los Angeles, which I can't wait to see. Tell me about this project, it sounds very unique. Gil: This is something that came about from conversations that I had with filmmaker David Michalek. His films are stunning, beautiful -- I find them to be mesmerizing. (He uses) a brand-new technology of super-slow motion, where he films things at about 1,000 frames a second and then slows them down. It's almost like you're looking at a still-life photo, and then very gradually -- if it's a portrait, the expression changes, or the feeling of it changes. I've always thought that the way he makes his films, the way he uses time, and the way he uses light, was very musical, that it would easily lend itself to music. As we spoke, we started talking about audiences and their experiences, and more particularly, how audiences today hear Bach differently from Bach's own audience. We talked about the references, how it would feel different for someone like me, who has never danced a bourree in his life, than for an audience of people who danced a bourree every Friday night. Or an audience member who would recognize the Lutheran hymn, Komm, Heiliger Geist, Herre Gott in the Chorale, because they sang in the church ever since they were a little kid. And so we thought that there might be a way to enhance a listener's experience today, when they're hearing the music of Bach. We had those conversations two or three years ago, and a couple of months ago I saw the films for the first time. There was a group of co-commissioners, the Los Angeles Philharmonic was one of them. So I'm thrilled to be part of this project. Laurie: How did it work? Did you send him recordings of yourself playing these? Gil: He had some other recordings, and there were a couple of times when I went to his apartment and played through the pieces for him. We really went into a lot of detail and talked about every page in the score. Laurie: Is he a musician as well? Gil: He's not a musician but he's very involved in dance, as he's married to one of the leading New York City ballet dancers, Wendy Whelan. And so I was fascinated, especially when we started talking about the Partitas and the Baroque dances and all the motions and movements involved with that. Laurie: You'd have to coordinate your playing with his film, I imagine. Gil: Somewhat, although he does give me complete freedom, which is amazing. So I can be on stage and do whatever I want. Laurie: Are you watching, while you play it? Gil: Actually, at first I wasn't going to, but we decided that I should use a monitor. For me, I'm more comfortable because then I can see what my audience is seeing, what people are reacting to. March 26, 2015 at 05:25 AM · "There's something about music that, once a composer writes it down, it gets translated into written music, and then you have to de-code it to what it was, and I think sometimes without living in that culture, it's hard to do that translation. " I should have this sentence framed and hang it on the wall of the music room. No, the projected "film" was not much of an issue – I mostly ignored it after a couple of minutes... I'm still waiting to be convinced that such abstract music as Bach's magnificent S&P needs or indeed can somewhat be helped (!) by representational, "program" images. Seems to me like imposing a visual connection onto the listener, which is at least a forced distraction or, at most, manipulating/patronizing and over-simplifying. The problem to this listener was with Shaham's interpretation or lack thereof – both the First Sonata and First Partita that I could stand to listen/watch were, to these ears, played very superficially, reminiscent of etude (not even caprice) playing. Yes, it was mostly accurate playing with even some virtuoso moments, yet voicing and timing were brushed over insensitively and crudely, with most chords played more akin to 19th-century virtuoso repertoire style, while trills and vibrato were executed (yes, executed!) at same/constant/fast speed regardless or the movement's tempo (and most tempi were too fast for me) and mood. Shaham displayed a strangely confined dynamic palette, his articulation direct, casual, devoid of subtle inflections (stiff right wrist and fingers). The dance-inspired movements were surprisingly un-dancelike in character despite their rapid tempi, while the more introspective movements were dispatched without grandeur, nobility, insight, mystery – there was little time taken for a sense of discovery, soul-searching drama, or revelation. Incidentally, I couldn't categorize Shaham's performance in any prevalent performing style: not in the 20th-century traditional "modern" approach (Grumiaux, Heifetz, Szeryng, Milstein, Tezlaff, Hahn), and most certainly not in the historically-informed, Baroque style (Podger, Holloway, Busch). Overall, a confused, confusing, and supremely disappointing Bach performance to this listener, sorely thin in both breadth and depth, a thoroughly missed opportunity, in my opinion. I couldn't wait to get back into my car and turn on Christine Busch's magisterial recording of these works... Sure, I will certainly hold on to the half-dozen or so Shaham CDs in my collection, but will most definitely not rush to get his Bach. March 26, 2015 at 05:34 PM · Certainly controversial! April 1, 2015 at 09:53 PM · Andrei, I don't agree with your assessment. Though it's hard to hear Bach played so differently (and I do agree that it defied categorization), I think it was a thoughtful and legitimate performance with a lot of beauty and even revelation. I'm not saying that everyone should start playing Bach this way, but Gil Shaham is an artist and his performance had integrity and polish. I felt honored to be there, it's one heck of an accomplishment. Here is my review of the concert. I didn't say I found listening to Bach "hard" (the opposite is true! ), I just found Shaham excessive brushing over texture, phrasing, and articulation subtleties and variations as missing the point and complexity that makes Bach, Bach, and these masterpieces the incredible treasures they certainly are to all of us... I have experienced NO hardship listening to any of my other twenty or so recordings of the VSP, but, as I mentioned, I will not be rushing to add Shaham's rendition to my collection. My ears failed to find beauty in his choice of tempos and overwhelmingly flat voicing (I don't need to reiterate my assessment) – I certainly left after the first third of the concert without any sense of revelation at any level in any area of performance or interpretation, just bewildered and utterly disappointed. To each their own! Yes, Shaham IS undoubtedly an artist and his performance had integrity and polish in its own way (at his level, it better had, right?!?). I just didn't agree with his interpretation; would you take his recording of the VSP above all others (HIP or not) to the proverbial desert island? The connection you imply between memorizing these pieces and the merit of their actual interpretation fails me, though (apples to oranges). Frankly, I would have much preferred Shaham played using a copy of the autograph manuscript or the Bärenreiter edition and notice the pains Bach went to to notate the layered voices, clearly signaling the performer the intended texture(s). April 3, 2015 at 07:37 PM · Actually memorizing all the Bach is quite an accomplishment; they are particularly difficult to memorize. Just because someone is an elite musician does not make it inappropriate to point out the fact that a towering accomplishment is still a towering accomplishment. I'm an average violinist, but a Suzuki teacher who easily memorizes music. I memorized three of those S and P's in college, and more over the years. And yet every time I come back to them, I have to re-memorize them anew. They don't "stick" like other things do because there is so incredibly much going on in them. And then to play them live -- wow. It's been done by Jennifer Koh, Christian Tetzlaff -- but this is no everyday occurrence. It is a special event.